The results of last week's poll are in! There were only seven votes, which leads me to think that most people didn't feel strongly one way or the other. 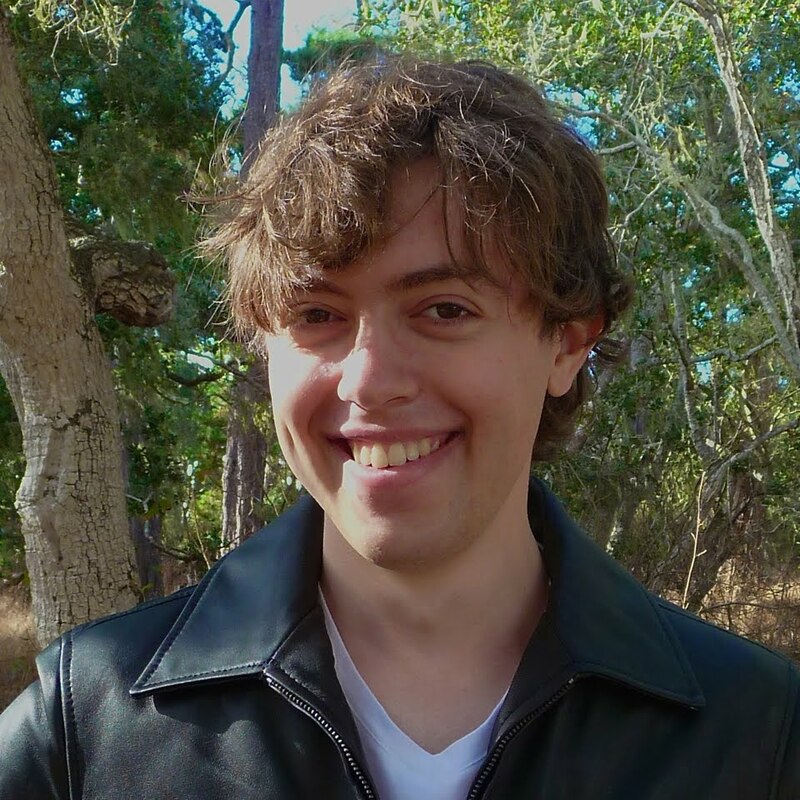 Of those seven, though, one person was in favor of running the contest and finishing the litzing, one didn't want the contest because of training for the ACPT, three didn't want the contest because they preferred that we take our time, and two weren't sure and said either way would be fine. So since more than half the votes were against running the contest, we'll just proceed as usual rather than embarking on a World War II–era crossword "litzkrieg"! We passed another milestone this week: 15,000 litzed puzzles! Great job, everyone! The week started off with 7 puzzles from Vic Fleming on Saturday afternoon. Early Sunday morning, Jeffrey Krasnick sent in 16 puzzles, bringing his total to 1,000 litzed puzzles—congratulations, Jeffrey! 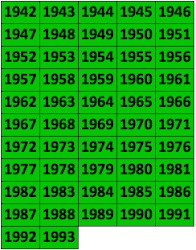 That afternoon, Lynn Feigenbaum sent 7 more puzzles, then that night, Denny Baker sent in 7 puzzles. Monday evening, Todd McClary sent 5 puzzles, putting us over 15,000 on the litzing thermometer! Tuesday evening, Vic sent 6 more puzzles, then 10 minutes later sent 7 more! Wednesday morning, Lynn sent in 7 more puzzles, which were followed by 7 from Barry Haldiman that afternoon. Friday morning, Barry sent in another 7, which were followed by 7 from Lynn that afternoon. And Howard Barkin sent in 21 puzzles this week. Thanks so much again, everybody—we're at 15,065 and in the home stretch! Some time ago I mentioned that as we got closer to the end, I'd post a list of the missing puzzles. I've grouped them below into those that were missing because of newspaper strikes and those that were missing for some other reason. None of these missing puzzles and/or solutions could be found on ProQuest. When I searched for some of them on microfilm, they weren't there either. Though if necessary we can try solving the puzzles that are just missing solutions, I think the best bet with the newspaper strike puzzles is to search for them in papers that ran the puzzles concurrently. 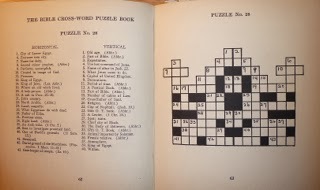 Margaret Farrar, in her foreword to Crosswords from the Daily Times, Series 9, said that during the strike between December 1962 and April 1963, the daily puzzles were published concurrently in the International and Los Angeles editions of The New York Times. This book contains those daily puzzles from that period, so we already have them. But we're still missing Sunday puzzles from that time, as well as many daily and Sunday puzzles from other strikes. I'm planning to continue trying to find these puzzles when I have more time this summer, but if anyone wants to try now, that would be great! If you do find anything, please send me the PDFs, and I'll update this list. I was looking through the collection of crossword books Stan Newman sent me last year and discovered six volumes of Bible crosswords that date back to the 1920s and 1930s. Two of these books were published in 1925, though neither one has more specific publication specs; I'm guessing the older of the two (and the oldest in my collection) is Bible Cross-Word Puzzle Book, by Reverend Paul J. Hoh. A teacher recently entered a Sunday school room and found four of the older boys absorbed in the solution of a Cross-Word Puzzle in a daily paper. He helped them over some hard places, and was struck by the fact that when he supplied an unusual word the boys invariably asked its meaning. That is the value of the "Bible Cross-Word Puzzle Book." It concentrates attention upon the Bible. Instead of Webster's the solver must use the Bible or Bible Dictionary or Concordance, and naturally he will want to know something about the names and unusual words he finds. He cannot fail to increase his Bible knowledge. What really makes this paragraph interesting to me is how solvers in the early days were so open to learning about and researching unfamiliar words and phrases. If a handful of obscure biblical references were used in a crossword today, crossword bloggers and commenters would likely throw their virtual hands up in frustration and see the puzzle in a very negative light. 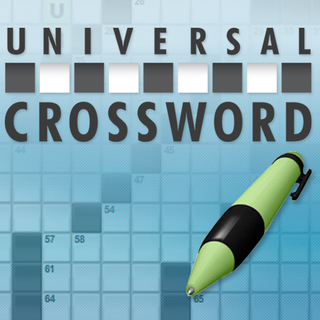 So what has happened to crossword solvers over the course of nearly a century? My impression is that everyone in general has become more impatient. 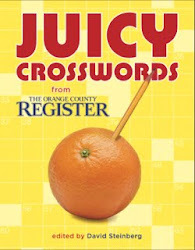 People no longer care for crossword puzzles that simply build vocabulary or knowledge—nowadays, in order to be well received, themed crosswords must be fantastically twisty and filled with common words to the greatest degree possible. It's interesting that the way in which puzzles provide entertainment has completely changed. Anyway, on to the Bible crosswords themselves. 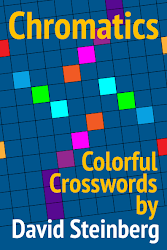 Although the puzzles have a sizable number of two-letter words, unchecked squares, and disconnected regions, they're jam-packed with theme entries. Almost all the biblical clues read in the style of "A city of Shinar. (Gen. 10.)" [for ERECH]; when the constructor got stuck pluralizing a biblical term, it received a clue like "An Eastern Country. Poss. (II Kg. 16.)" [KIR'S]. I was a bit disappointed to discover that the author used a single clue each time an entry appeared (CANA was clued as "Where Jesus performed first miracle." in puzzle 1 and puzzle 2). I assume the constructor didn't vary the clues because he wanted his solvers to feel like they had learned something that could then immediately be applied to a subsequent puzzle, though seeing the same definitions over and over again makes one's solving experience rather dull. One aspect of puzzle construction in which the author was exceptionally creative was grid design. 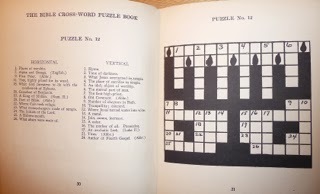 At 9 x 9 and 11 x 11, the Bible crosswords' grids were smaller than those of most contemporary crosswords; however, the constructor still found ways to make them resemble religious items ranging from a candelabra (puzzle 12) to a church (puzzle 28). Puzzle 30 goes so far as to make the grid look like a pyramid! The constructor accomplished some of these wacky grid designs by using black and white circles and triangles in conjunction with the traditional black and white squares. 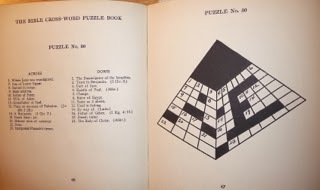 One puzzle in this book (15) stands out to me as being truly brilliant and nearly a century ahead of its time! The grid is shaped like a compass rose, and the clue headings read AROUND THE CENTER and TOWARD CENTER rather than the traditional HORIZONTAL and VERTICAL. 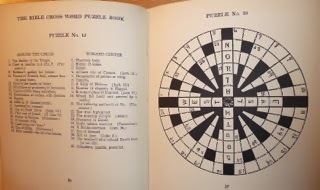 The entries NORTH, SOUTH, EAST, and WEST are pre-entered into the grid, and solvers are required to rotate the book to enter answers into the grid. Seeing such creativity in a crossword puzzle from 1925 is awesome! 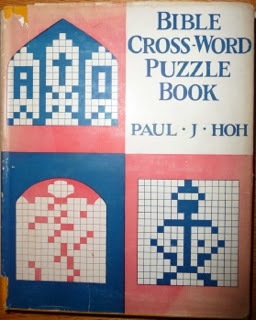 All in all, I very much enjoyed looking through Paul J. Hoh's Bible Cross-Word Puzzle Book! Thanks again to Stan Newman for sending me part of his collection of old crossword books, and I look forward to seeing what other interesting puzzles crop up in the other books I have from that time period!